Well. What do we want to test? The goal is to measure the client-side perfomance (without backend logic) of JS script block executions for PrimeFaces p:inputText / p:selectOneMenu. We want to test an editable p:dataTable with inputs / selects components in table cells. The table has 25 rows and 16 columns, that means 25 * 16 = 400 cells. Every cell contains either an input or a select component. There are 6 test cases. Standard h:inputText and h:selectOneMenu don't have JS script blocks, so it is interesting to see what for impact JS widgets have. If we assume that component renderers take approximately the same time to render HTML output, we can calculate the time for JS script block execution of a single p:selectOneMenu. This time is 11,3 ms. That's too much. The reason may be many inefficient jQuery selectors in widget's constructor. I don't know and it doesn't matter here. On my notebook with Ubuntu, I got a huge time difference ca. 10 sek. The browser with 400 p:selectOneMenu tags almost "freezes". Some people say "JSF is slow, JSF is not a right technology". Wrong. JSF is fast enough. It depends on how to use this framework. Editing of everything at once is nice, but obviously it is not recommended to use a large editable DataTable with rich JSF components. What would be an alternative for editable DataTable? There are many ways, depending on individual preferences. I will try to propose some ones. Use standard JSF select components in large editable tables. But what is with theming? No problem. All modern browser, also IE8 and higher allow to style native HTML select elements. You can adjust colors for borders, background and let selects look more or less stylish according to applied theme. Presupposed is of course, you don't need advanced features such as custom content within select components (filter functionality or whatever). Cell editing feature in PrimeFaces renders native select elements and it is fast. Row editing feature in PrimeFaces renders native select elements and it seems to be also fast. Master-Detail approach in one view. You select a row and see details to edit. Details can be shown outside of the table - on the right side or at the top, depending on table's width / height. Master-Detail approach with separate views. You select a row and switch the views. Instead of table, you see details like in the MasterDetail component of PrimeFaces Extensions. From details you can go on to another levels to create / edit more details and then, at the end, jump to the overview table again. I hope, you enjoyed this post :-). Comments and suggestions are welcome. 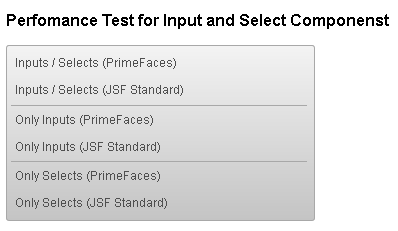 We are glad to announce the new 0.7 release of PrimeFaces Extensions. This is a main release which contains a lot of improvements and bug fixes. The full list of closed issues is on the GitHub. I would like to pick up some highlights. There are many, many fixes for pe:ajaxErrorHandler. The reason: more users, incl. team members of the Extensions project started to use this component. We are thinking now to add a support for non AJAX requests too. Let's see where we will end up. Enum values can be accessed on pages directly by the new pe:importEnum tag. Usage is demonstrated in this use case. This is a new component which provides many features such as export of multiple tables, sub-tables, tables with grouping, cell editing, dynamic columns, customized format, etc. It supports exporting of DataList and custom exporter via Java ServiceLoader mechanism. Demo is available here. This component is continuing to grow, more features are on TODO list. This is a better choice in comparison to specifying options per attributes. Support of iframe acting as layout pane and updatable nested layouts were postponed to the next release. TimePicker got a huge update. JS script was updated, fixed a collision with p:calendar and an issue in Chrome, but especially handy is a new attribute showOn. Similar to the PrimeFaces Calendar, this attribute defines the behavior when the timepicker is shown. focus (default): when the input gets focus, button: when the button trigger element is clicked, both: when the input gets focus and when the button is clicked. The online demo is available here. Timeline was reimplemented almost from scratch and this is the most interesting highlight of this release! 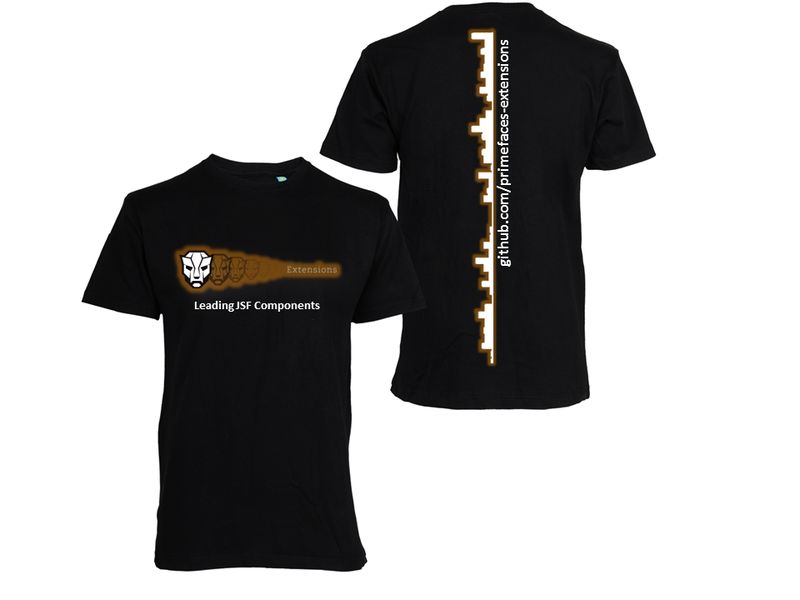 First, thanks to the Applus IDIADA - company that sponsored the Timeline component. The new Timeline has features such as editable and read-only events, event's grouping, configurable zoom range, min. / max. dates for visible range, client-side and server-side API, i18n support, theming and more. We were excited to develop these interesting features. Explore various timeline features yourself, e.g. client-side API, server-side API or grouped events. Get thread-safe TimelineUpdater instance by timeline's Id (in terms of findComponent()). Invoke one or many (batch mode) CRUD operations, such as add, update, delete, deleteAll, clear, on the TimelineModel with the TimelineUpdater as parameter. Well, this was the first design, the word "PrimeFaces" is missing :-). It should be "PrimeFaces & Extensions". The back side doesn't show buildings as some readers may think. It shows the commit history on the GitHub :-). What is the next? The project is stable. We have very small amount of open issues (around 20). This is a right time to grow. The next main release 1.0.0 will contain 3 new components! They will have the same quality as Timeline. The expected release date is tightly coupled with the upcoming PrimeFaces 4.0. Stay tuned.